Thermonuclear bomb also called hydrogen bomb, or H-bomb, thermonuclear bomb: detonation in Marshall Islands, 1952U.S. Air Force photograph weapon whose enormous explosive power results from an uncontrolled, self-sustaining chain reaction in which isotopes of hydrogen combine under extremely high temperatures to form helium in a process known as nuclear fusion. The high temperatures that are required for the reaction are produced by the detonation of an atomic bomb. A thermonuclear bomb differs fundamentally from an in that it utilizes the energy released when two light atomic nuclei combine, or fuse, to form a heavier nucleus. An atomic bomb, by contrast, uses the energy released when a heavy atomic nucleus splits, or fissions, into two lighter nuclei. Under ordinary circumstances atomic nuclei carry positive electrical charges that act to strongly repel other nuclei and prevent them from getting close to one another. Only under temperatures of millions of degrees can the positively charged nuclei gain sufficient kinetic energy, or speed, to overcome their mutual electric repulsion and approach close enough to each other to combine under the attraction of the short-range nuclear force. The very light nuclei of atoms are ideal candidates for this fusion process because they carry weak positive charges and thus have less resistance to overcome. The hydrogen nuclei that combine to form heavier helium nuclei must lose a small portion of their mass (about 0.63 percent) in order to “fit together” in a single larger atom. They lose this mass by converting it completely into energy, according to Albert Einstein’s famous formula: = mc2. According to this formula, the amount of energy created is equal to the amount of mass that is converted multiplied by the speed of light squared. The energy thus produced forms the explosive power of a hydrogen bomb. Deuterium and tritium, which are isotopes of hydrogen, provide ideal interacting nuclei for the fusion process. Two atoms of deuterium, each with one proton and one neutron, or , with one proton and two neutrons, combine during the fusion process to form a heavier helium nucleus, which has two protons and either one or two neutrons. In current thermonuclear bombs, lithium-6 deuteride is used as the fusion fuel; it is transformed to tritium early in the fusion process. Teller-Ulam two-stage thermonuclear bombEncyclopædia Britannica, Inc.In a thermonuclear bomb, the explosive process begins with the detonation of what is called the primary stage. This consists of a relatively small quantity of conventional explosives, the detonation of which brings together enough fissionable uranium to create a fission , which in turn produces another explosion and a temperature of several million degrees. The force and heat of this explosion are reflected back by a surrounding container of uranium and are channeled toward the secondary stage, containing the lithium-6 deuteride. The tremendous heat initiates fusion, and the resulting explosion of the secondary stage blows the uranium container apart. The neutrons released by the fusion reaction cause the uranium container to fission, which often accounts for most of the energy released by the explosion and which also produces fallout (the deposition of radioactive materials from the atmosphere) in the process. (A neutron bomb is a thermonuclear device in which the uranium container is absent, thus producing much less blast but a lethal “enhanced radiation” of neutrons.) 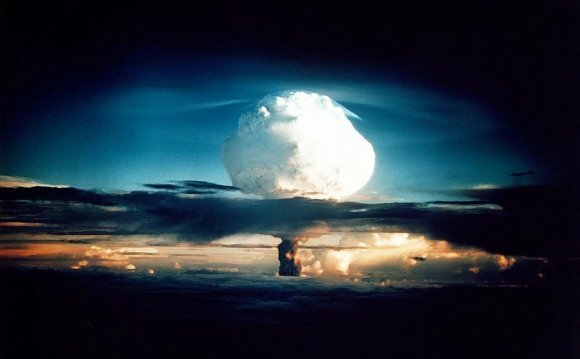 The entire series of explosions in a thermonuclear bomb takes a fraction of a second to occur. A thermonuclear explosion produces blast, light, heat, and varying amounts of . The concussive force of the blast itself takes the form of a shock wave that radiates from the point of the explosion at supersonic speeds and that can completely destroy any building within a radius of several miles. The intense white light of the explosion can cause permanent blindness to people gazing at it from a distance of dozens of miles. The explosion’s intense light and heat set wood and other combustible materials afire at a range of many miles, creating huge fires that may coalesce into a firestorm. The radioactive contaminates air, water, and soil and may continue years after the explosion; its distribution is virtually worldwide.